Photo from Sir Sonny's Facebook profile. 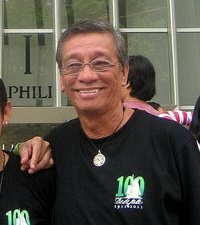 The Philippine Lasallian Family mourns the passing of Santiago "Sonny" Alvarez Jr. (De La Salle College High School 1964) yesterday, 2 August, sometime between 5:30-5:45pm. Papa Archer, as he was affectionately called, was the Sports Director at De La Salle-College of Saint Benilde. His remains lie in state at the National Shrine of the Divine Child, La Salle Green Hills. Lasallians have taken to social media to pay their respects. Below are some tweets in honor of their Papa Archer. My prayers to the great and generous man who stood by his principles and values. Rest in peace, Tito Sonny. You will surely be missed. Rest in peace Sir Sonny Alvarez. Thank you for the never ending support you've given to the DLS-CSB varsity. May you rest in peace Mr. Sonny Alvarez, you've left a legacy in the sports dept. and in the community. We will never forget you, animo!! Update 1: Added schedule of Masses and corrected interment details.